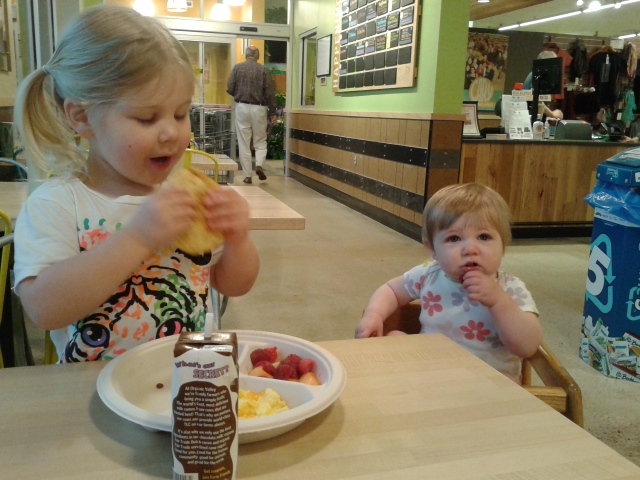 Thursday I took LB and BIT for breakfast at Whole Foods before BIT’s 9 month well visit. Another prime example of the chasm between expectations (or hopes) and reality with a toddler. Actually, I’m not giving the Littlest Brewster enough credit. Yes, she runs around like an idiot. Yes, she asks a million questions, embarrassingly loudly, including wondering why that man’s face looked like it did. (For the record, his face was totally normal. She just decided it was questionable.) Yes, she wiggles and squirms in her chair and needs commands to be repeated a dozen times before deigning to carry them out. Okay, no, she’s getting plenty of credit. She’s a handful. But at least she’s a pleasant handful and most everyone smiles rather than scowls when observing her antics. After breakfast was BIT’s 9 month well visit, thankfully with no shots! She got a clean bill of health from the doctor and we were told she’s progressing totally normally. I always get a little nervous because they give you that questionnaire to fill out as to what your infant is and is not doing yet and neither girl has ever gotten a perfect score. Which is certainly not a big deal, as both girls are obviously rockstars and I should just calm the heck down. I’m pretty certain our pediatrician thinks I’m a total nut job as I consistently ask questions that sort of make her give me the side eye. For instance, today I asked if it mattered if BIT ate food items that had been cooked with honey in it. For the record, Dr. Gallagher assured me that it’s okay to feed BIT things with cooked honey in it, just make sure not to give her the raw stuff. Yeah, I’m pretty sure she thinks I’m totally neurotic. And quite possibly irresponsible. Luckily you guys all know the truth. This entry was posted in Babies and tagged BIT, Doctor Visits, Infant Botulism, LB by BrewsterMama. Bookmark the permalink. Oh god, I do that “you eat what’s on your plate or you go to bed hungry” with my 2 year old all the time. Fortunately the baby eats everything he can get his hands on, which may or may not include actual food, so I don’t have to worry about that. I didn’t know that about the cooked vs raw honey. That would have saved me some stress around certain cooked items too. Ah well! One of BIT’s favorite snacks is the bowl of cat food in the kitchen. We finally admitted defeat and moved it up out of reach.